Stokie and Essie-Jo began running Stokie's with the sole intention of creating dance events of the highest quality, that were friendly, inclusive, with fantastic music. They also teach dance as private one-to-ones, weekly classes, and at some of the UK's largest mixed dance weekenders. They host monthly tango, and blues dance events. They also arrange and run Stokie's three annual dance weekenders. 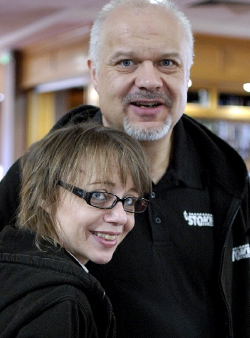 With decades of experience between them, you really are in safe hands with Stokie's Events and classes. Stokie's are delighted to bring you The Sunday Session. A heady mix of the finest music for dancing whatever your style or level of experience. DJ Stokie's choice of traditional tango music is renowned for being beautiful, and making you want to dance. Music will be presented in tanda's and cortina's, and will be 100% traditional. Expect to hear much music played that respects the 'great eight'. When it comes to blues nights we like to keep the formula simple. Fantastic music, friendly crowd, lovely sprung wooden floor and an atmosphere that is out of this world. You may end up wondering where the night vanished to as DJs Stokie and Roach play six hours of the finest tunes to seduce your ears and make your feet beg you to dance. If a laid back atmosphere, a unique blend of music, friendly dancers and a late finish sounds like your type of a night, then have we got a treat for you. We have a beautiful sprung maple dance floor, free parking, friendly dancers from all over the UK, a laid-back, relaxed, party atmosphere that is like no other. There is no licensed bar, but a small selection of soft drinks, fresh tea and coffee is on sale through the night, and you are most welcome to bring your own drinks if you wish. Come and be a part of the tango underground with Tango Stoke. We are delighted to invite you for another night of carefree social alternative dancing. The evening consists of two tango DJs playing a huge variety of non-tango music for you to dance tango to. There will be music from all sorts of times, places, backgrounds and styles. All of it suitable for carefree social tango dancing; none of it composed with tango in mind. There will be no tandas, no cortinas, no traditional tango music, no modern tango music and no cabaceo. Dance with who you like, for as much or as little as you like, eat, drink, laugh, dance and have a good time. What an excellent way to start your weekend! A weekend aimed squarely at the dance addict. A weekend with the focus on social dancing for extended periods of time. With no evening passes into this event, it gives dancers the opportunity to connect with each other as individuals as well as dancers. Add in a connection to the music, the floor, and each other that the carefully placed clases promote and you have a recipie for an incredibly special weekend of dancing. Lock-In? More like your chance to 'lock the world out'. Cost £220 per person booked BEFORE March 9th 2019, after that £250. Places are only secured with a £40 non-refundable deposit. Full balances are due on March 8th 2019. Booking is now open! For advanced availability information, and event details please contact Essie Jo via Facebook private message or on 07768 469 777. This weekender is FULL BOARD. There are NO freestyle only/evening passes for this event. Come and explore your dance potential with us. Embrace It, is a full board, two-room weekend of Tango and Blues enveloped in that unique, friendly, Stokie's atmosphere. This weekender is all about the learning. With classes through the day, and then freestyle in the evening so you can consolidate your learning, it's a weekend to really accererate your dancing. Improve your current style, or perhaps dip your toes into another style. With Tango and Blues dancing being such close cousins, our teachers will show you how to transfer your skills with ease. The music will be a balance of traditional and modern (both Blues and Tango). Cost £220 per person booked BEFORE July 14th 2018, after that £250. Full balances are due on July 13th 2018. Booking is already open, for availability and event details please contact Essie Jo via Facebook private message or on 07768 469 777. Explore your dance potential with us. At Stokie's you know it's all about the dancing. This is a weekend of pure dance indulgence. From funky and fun afternoon dancing, through the up-tempo evening tracks, savouring the sumptuous late tracks and dancing to the dawn chorus to the best music from the UK's leading weekender DJs. Before you know it you'll have danced through 'til dawn and the smell of a freshly cooked breakfast. Put your dance shoes on when you arrive on Friday, and you don't have to bother your feet with street shoes until Sunday afternoon. We have sole use of a beautiful independent hotel right in the middle of the country. It is less than a mile from J24 on the M1, and a two mile taxi ride from East Midlands airport and the nearest train stsaion. However you look at it, Kegworth Hotel is slap bang in the middle. This weekender is FULL BOARD. There are NO freestyle only/evening passes for this event. Explore your dance potential with us.